Color is a crucial element in fashion. Or rather, fashion is meaningless without color. It is especially important for sweaters, and being able to produce beautiful colors is one of the great attributes of cashmere. There are several hair color types of cashmere goat: white, beige, brown, grey and black. Natural black down is very rare, and black yarn is usually dyed. Cashmere hair is too thin to bleach. The bleaching and dying process could reduce the softness of the material, so only white cashmere can be used for light colors. Because UTO provides many light and bright colors, we use white cashmere more than other colors of cashmere. 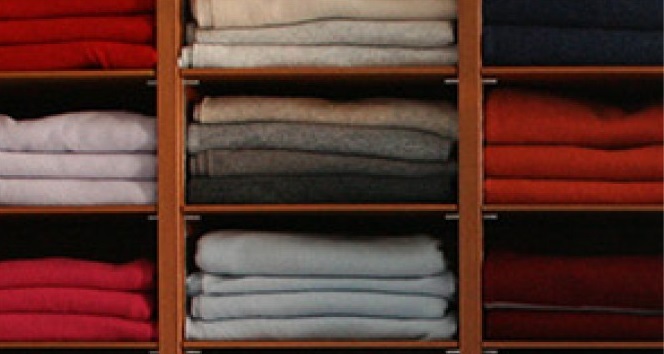 Back in the 50s in Japan, cashmere clothing came only in dark colors like grey, wine, navy, camel, and black. These were iconic enough to be called “cashmere colors.” The reality was that Japan at that time did not have enough foreign currency to purchase expensive white cashmere. Now, our cashmere knitwear is made with many pastel and bright colors; customers sometimes comment that they did not know cashmere shades could be so beautiful and colorful. All of our cashmere colors—the dark colors and also the pastel ones—are solid. Not only is the fleece dyed; the different colors of fleece are spun together to make a cone of yarn. Colors are sometimes referred to as “light” or “deep.” Even our light colors are considered deep because the yarn is blended with different colors of fleece. For example, we offer red as a regular color that is made from three to five different colors of fleece. One grey cashmere product is made with black, white, light beige, light purple, and blue. It’s hard to spot the blue, but it is a hidden element that adds depth to the color. Blending different shades also greatly stabilizes the variation of colors. Our cashmere colors, not only the dark colors but also pastel ones are solid. Not only fleece is dyed, but also different colors of fleece are spun together to make a cone of yarn. Colors are sometimes expressed as “shallow” or “deep”. Even our light color is considered deep because the yarns are blended with different color fleeces. For example, we offer red as a regular color which is made from three to five different colors of fleece. One gray is made with black, white, light beige, light purple, and blue. It’s hard to spot blue, but it adds depth to the color, a hidden ingredient. Blending different shades also stabilizes the variation of colors by a lot. All animal hair tends to become stiffer when it’s dyed. That’s because the hair is boiled for a long time for the color to be fixed, and the proteins in the hair harden more with a darker dye. Therefore, you may notice when comparing light- and dark-colored cashmere that the former may feel a bit softer. Ultimately, undyed cashmere probably has the most delicate texture. Colorfastness indicates how lasting the color is. Usually, the higher the colorfastness, the less soft the texture. 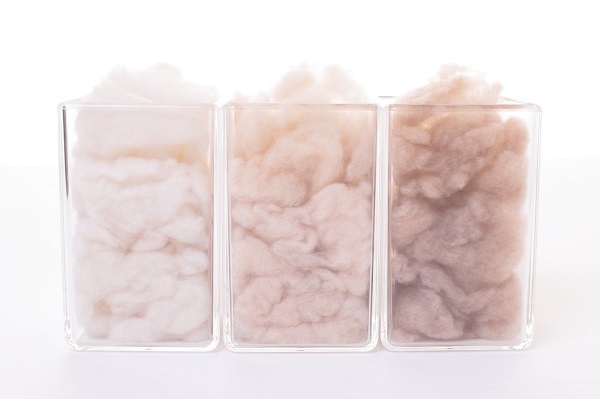 However, our yarn supplier Toyoboshi has developed a new dyeing process with a lower temperature to retain the softness of cashmere regardless of color. It made big news globally in the industry. Master artisans from various fields vouch for our cashmere knitwear.